Tomorrow, Tuesday 6 November , at 6:00 pm , in the Ateneo de Málaga auditorium, the screening of ' Breathing Underwate r', by Koh Hee-young , will take place, first of the three films that make up ' Korea a Through the Lens of Gender ', a cinephorum cycle that seeks to give visibility to the situation of Korean women, its transcendence in society and history, while reflecting on the role of women in the audiovisual field from three perspectives: creative , spectator and protagonist. Therefore, after each screening, colloquiums will be held by various specialists on the aforementioned topics and linked to the plot and poetics of each film. Admission is free until full capacity is reached. 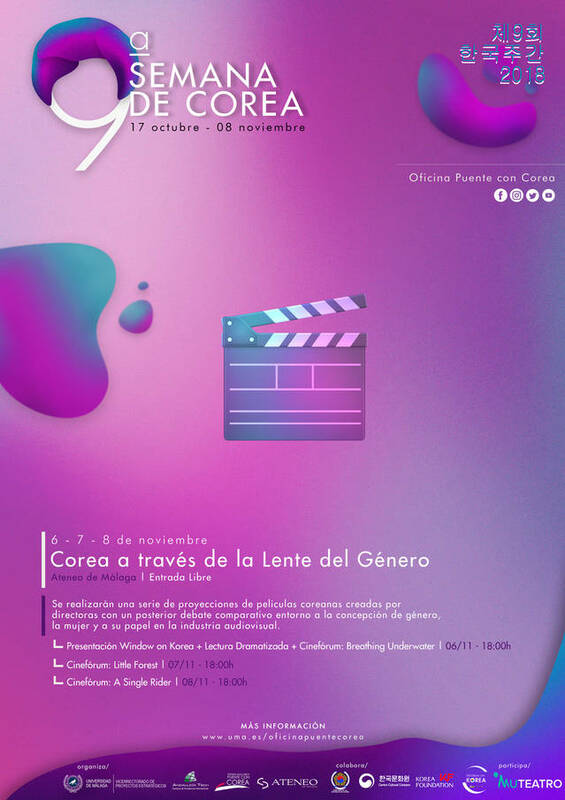 With the start-up of this film series, the 9th Week of Korea is the finishing touch, whose main objective is to bring Korean culture closer to the university community and, therefore, to the city of Málaga through a wide repertoire. of cultural activities. This film forum not only seeks to publicize recent films of the Korean scene but also generate debate to create social awareness about the situation of women, which currently extends to all areas of our society. For this, and after each screening, specialists from various academic and professional fields will discuss those aspects linked to the plot and poetics of each film and related to feminism. It is, after all, about knowing and analyzing the situation of women in East Asia from a more real and plural perspective. It is, after all, about knowing the contemporary history of Korea through the history of its women.